I have a fabulous little recipe for you today! It is so easy, and so yummy! And when I say easy, I mean EEE-ZEE!! I think you’re gonna love it! If you are a fan of Chicken Parmesan (and who isn’t), then you are definitely in for a treat! 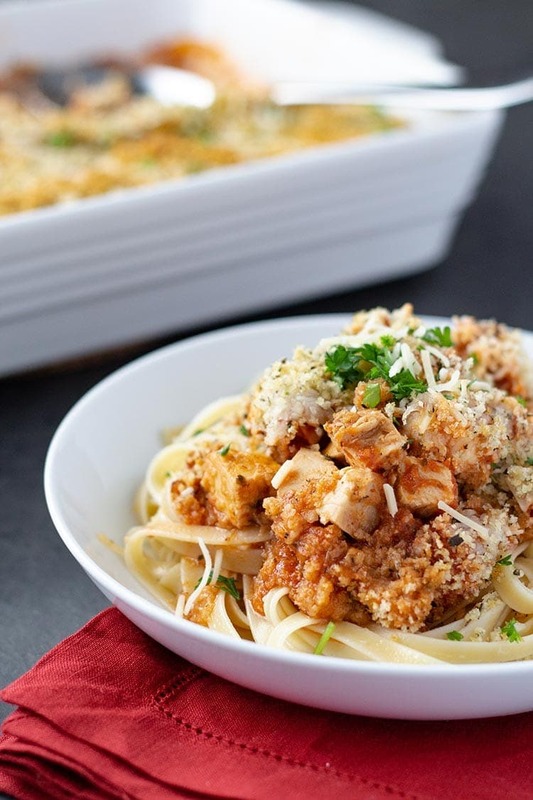 This Easy Chicken Parmesan Bake is a freezer meal twist on the classic Chicken Parmesan. But there is no breading or frying involved. In fact there is fairly minimal prep work involved, and if you do like I do and keep diced grilled chicken around in your freezer, or make big batches of cooked chicken when it goes on sale, then you can have this freezer meal ready to go in about five minutes. I love this chicken Parmesan bake because it is easy to fix. My kids love it because, well, what is not to love about chicken smothered in marinara sauce, a nice thick layer of mozzarella and Parmesan cheese, and then topped off with a toasty bread crumb topping?!? I mean, really. This freezer meal easily ranks high on the “comfort foods” list. 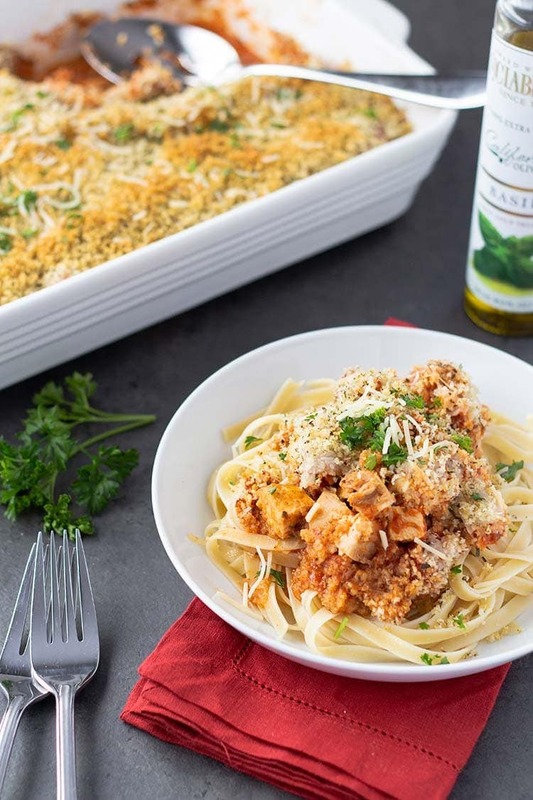 I like to make this Parmesan chicken freezer meal when I find great deals on chicken in the summer and grill large batches of chicken breasts to save for later. I leave some of the chicken to be used in this meal, and then make up a few trays of the chicken Parmesan bake to go into the freezer. You can also use pre-cooked chicken you might have in the freezer already hanging out looking for a job. This makes preparing this already-quick freezer meal almost effortless! But you don’t have to start with pre-cooked chicken. It’s just easier. If you’re making up a couple of these casseroles and don’t have pre-cooked chicken on hand, you’ll just need to cook your chicken first. That will be your longest and most complicated prep step. You can easily increase the flavor level on this family dinner dish by giving your chicken a little extra bump of seasoning when you cook it. I like to use grilled chicken that has been seasoned with something like McCormick’s Montreal Chicken or Weber’s Kick’n Chicken seasoning. It adds just a little extra flavor without interfering with the main flavors of the dish. And there’s just something about chicken grilled over an open flame that brings out flavors you can’t get any other way. But if you have neither the time nor the inclination nor the equipment to grill up some chicken on your outdoor barbecue, cooking some in a skillet or pan on the stove top will work just fine. In fact, you could even just broil a batch of chicken breasts in your oven. It all works! I personally like to use aluminum pans for this meal. I don’t have enough baking dishes or pans to make meals to leave in my freezer. But you can certainly use any of those in a pinch. Whatever dish or pan you choose, you’ll want to make sure it is 9 x 13 or close thereto. You’ll put your diced chicken into your pan and add in your marinara sauce of choice. Mix those two ingredients together until the chicken is thoroughly coated, and then spread the chicken mixture out evenly across the bottom of the dish or pan. Next, layer on your mozzarella cheese, followed by the Parmesan cheese. Prepare your bread crumbs in a small bowl, and then sprinkle all over the top of the dish. That’s it. If you’re freezing for a later meal, you’ll cover/wrap and label, then away it goes into the freezer! If you’re baking immediately, you’ll stick it in the oven and in about 30 minutes you’ll have a fabulous dinner ready to eat! 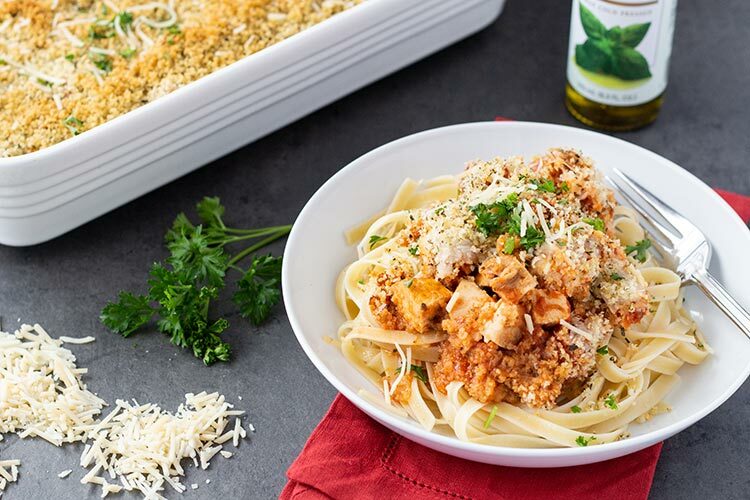 Now, we generally eat this Easy Chicken Parmesan Bake served over pasta. You can also serve it over rice. But it is hearty enough to stand as an entree on its own. Serving sizes and how much one pan will actually feed will depend a bit on how you choose to serve it. I highly recommend a simple green salad with a nice Italian dressing or vinaigrette to go along with the chicken Parmesan. And if you’re not gluten-averse, a loaf of crusty bread or garlic bread is a MUST! For all my low-carb and/or keto friends out there, this fabulous chicken freezer meal is easily adaptable for low-carb! When I make this, I leave one corner of the dish without the breadcrumb topping. Or if the entire family is eating low-carb or keto (or you’re making this for a potluck, church dinner, etc. ), you can leave the breadcrumbs off all together. It still tastes AMAZING! For low-carb and keto, I suggest using a bottle of Rao’s Homemade Marinara Sauce (due to it’s only having 4g of carbs per serving) or another no-sugar-added jarred sauce, or make your own. There are lots of recipes out there. Melissa at I Breathe I’m Hungry has a great one that is super simple to whip up! Although I prefer chicken breasts for this meal, you could use chicken thighs if you’re trying to hit specific macros. Easy Chicken Parmesan Bake will store nicely in your freezer for several months, that is, if it even lasts that long! I have not tried heating this one directly from frozen, although theoretically it should work just fine. You’ll need to double the cook time – leave it covered for the first half, and then uncover it for the second half of the cook time. I prefer to pull the Chicken Parmesan Bake out of the freezer the night before and let it thaw in the refrigerator overnight, then heat the next day from thawed. If you make some of this freezer-friendly Easy Chicken Parmesan Bake, I’d love for you to comment below or post to Instagram and tag me (@MakeAheadMealMomma)! And I would especially love it if you would rate this recipe – I find the ratings so helpful when I am looking through recipes online, so I could really use your help rating the recipes you find here on my blog! And definitely be sure to pin this one to your Pinterest boards! 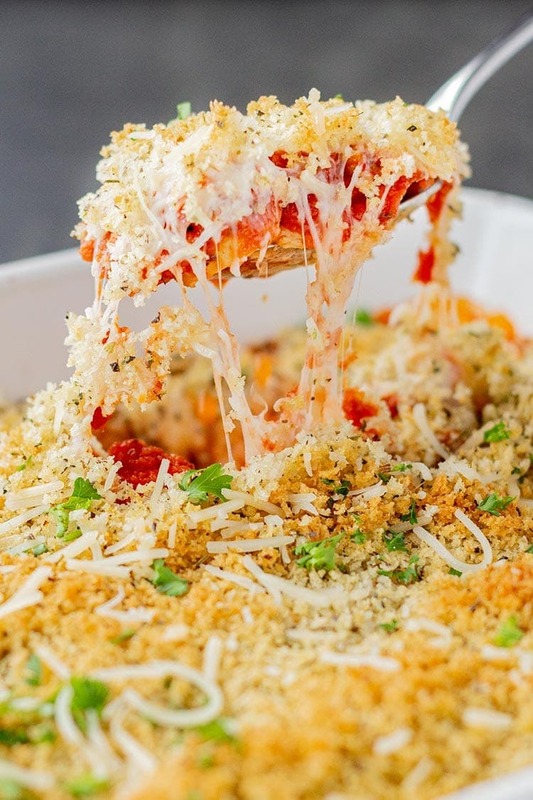 A fast and fabulous freezer meal, with minimal prep and outstanding flavor, this Easy Chicken Parmesan Bake is a sure winner for tonight's dinner!! Spray a 9x13 baking dish (or aluminum pan if freezing) with your preferred cooking spray. Place diced cooked chicken into the dish. Pour in marinara sauce and add the Italian seasoning and salt and pepper. Mix to combine, until the chicken is thoroughly coated with the sauce. Spread chicken layer evenly across bottom of pan or dish. Sprinkle mozzarella cheese on top of chicken mixture, then top with the Parmesan cheese. In a small bowl, add the first three breadcrumb topping ingredients and stir gently with a fork. Add the olive oil, and toss with fork until breadcrumbs are evenly coated but not sticky or clumping. Gently sprinkle breadcrumb topping over the Parmesan cheese layer. Wrap or cover dish, label, and place into freezer. Be sure to include date made and heating instructions. Will keep in freezer for 3-6 months. Remove from freezer and allow to thaw overnight in the refrigerator. Bake at 350 degrees Fahrenheit for 25-30 minutes, until bubbly and breadcrumbs are toasted and golden brown. Serve by itself or on top of pasta or rice. And don't forget the green salad! I have not tested this, but you can try heating from frozen - double your cook time to about 60 minutes - bake covered for the first 30 minutes, and then uncovered for the last 30 minutes. For low-carb/keto, leave off the breadcrumb layer either on a portion or all of it. Use a low-carb pasta or marinara sauce to keep the carb count low. Serve over low-carb pasta, riced cauliflower, or just savor it straight up if you prefer!